He's coming for them. And the kingdom. Haegan and Kaelyria Celahar are royal heirs of the Nine Kingdoms, but Haegan is physically crippled. 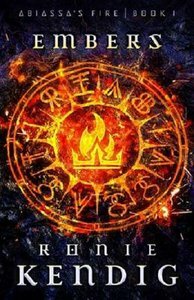 What chance does he have against Poired Dyrth, the greatest enemy the kingdom has ever faced, who wields fire with a power none can match?Their only hope is forbidden: Kaelyria must transfer her fire-harnessing abilities to Haegan. When she does it comes with a terrible price: Haegan's disability is healed, but only by being transferred to Kaelyria. This decision causes their father, the King, to unleash his wrath against Haegan.Haegan must flee the kingdom alone with two impossible tasks: Find a cure for Kaelyria and stop the coming war with the omnipotent Poired Dyrth. About "Embers (#01 in Abiassa's Fire Series)"